I love Chinese breakfast, there is always so much to choose from other than dim sum. One of my favourite for an early breakfast is a bowl of hot rice porridge or congee. As I have some chicken stock from last night chicken rice and some leftover cooked chicken, congee is perfect for the job while pottering about on a Sunday morning listening to the radio and doing a little housework at the same time. For this congee I like it quite watery so I used half cup of rice and 5 cups of chicken stock. Let it boil then simmer for about 1 hour. (use a large pot where possible, as the rice soup will boil over easy). Once the congee is ready, seasoned with a little salt. While it is still boiling hot, ladle into a large soup bowl. Quickly sprinkle on some shredded cooked chicken, a whole egg (or just the york). 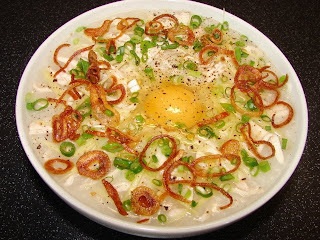 The egg or yolk will cook once stir into the piping hot congee. Then garnish with finely shredded ginger, spring onion, deep fried crispy shallots, few drops of sesame oil, sprinkling of ground pepper and some light soy. Here you go, simple and delicious breakfast. ** If you like the egg a bit more cooked, ping in the microwave for 1 minute before adding the garnish.